Congestion on the nation’s highways added $74.5 billion in operational costs to the trucking industry in 2016, according to the American Transportation Research Institute’s recent analysis. ATRI’s “Cost of Congestion to the Trucking Industry” update, released Oct. 18, relied on data from ATRI’s GPS database and the Federal Highway Administration to determine what costs the industry incurred from clogged roads. This year’s figure marks a 0.5% increase from the updated 2015 figure of $74.1 billion. The report notes that road delays added up to 1.2 billion hours in lost productivity. Distributing $74.5 billion across the 11.5 million large trucks registered in the United States means congestion costs each truck $6,478. 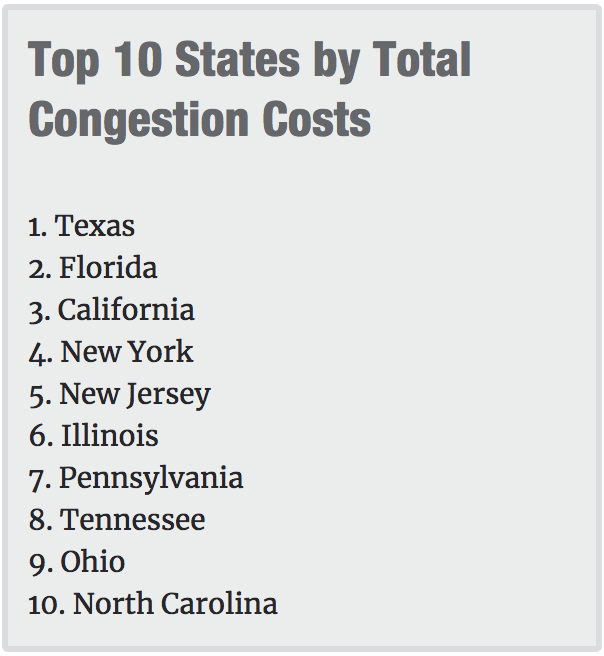 The list of top 10 states ranked by total congestion costs held steady with last year’s report, although the ranking order shifted slightly. Texas’ congestion cost was $6.3 billion. Runner-up Florida’s congestion cost was $5.6 billion. Florida Trucking Association President Ken Armstrong said the state’s large population (21 million, according to Census Bureau estimations) and booming tourism industry contribute to the hordes of motorists that clog the interstates. Visit Florida, the state’s tourism marketing corporation, reported that 118.5 million visitors traveled to Florida in 2017. ATRI found that the majority of congestion occurs on relatively short portions of road in urban areas. Some 86.7% of congestion costs occurred on 17.2% of National Highway System miles. More than 91% of 2016’s total congestion costs occurred in metropolitan areas. The New York City-Newark-Jersey City area again topped the list with $4.9 billion. To reduce the amount of vehicles clogging New York City’s streets, Gov. Andrew Cuomo has proposed congestion pricing in Midtown and Lower Manhattan. Cars and trucks would have to pay a fee once they entered this “congestion zone.” The purpose would be to encourage subway use and raise money to improve the public transportation system. Although Trucking Association of New York Executive Director Kendra Hems acknowledged that the transit system offers an alternative that potentially can clear up roads and curb space for trucks, she said congestion pricing is unfair to truckers. Georgia Department of Transportation spokeswoman Natalie Dale said that sound infrastructure, while important, is not a silver bullet for fixing congestion problems. Georgia, home to a growing population, many corporate distribution centers, inland and coastal ports and some of the nation’s worst freight bottlenecks, ranked No. 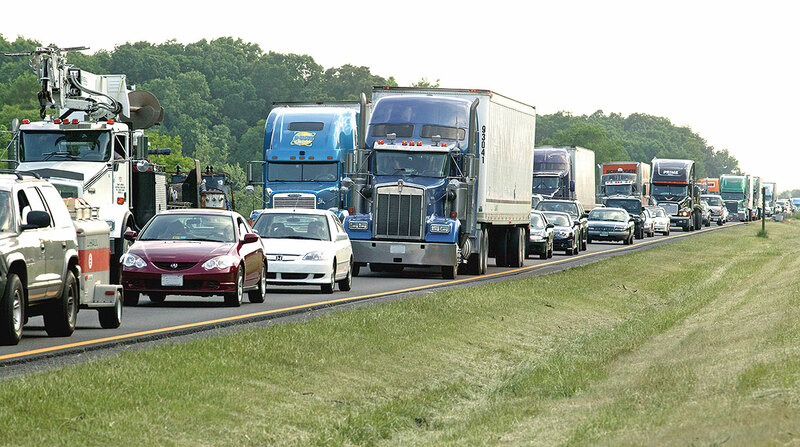 7 on ATRI’s list of states with the largest congestion cost increases, growing by $67 million. Robert Puentes, president of the Eno Center for Transportation, said ATRI’s report offers specificity, which can help states and cities invest prudently in certain “pinch points.” In mentioning specific locations, Puentes said the report includes details that President Donald Trump’s $1.5 trillion infrastructure plan lacks.